The Hungarian low-cost airline Wizz Air in January-February 2019 carried more than 300,000 passengers on its flights to/from Ukraine, which is 94% more compared to the same period in 2018, the company has said in connection with placing the fourth aircraft at the base in Kyiv and the launch of four new flights from Ukraine. “As a result of the growing demand among Ukrainian passengers … the airline offers 44 routes to 13 countries from three Ukrainian airports: Kyiv, Lviv, and Kharkiv,” the company said. According to the booking system, the matter concerns 28 flights from Kyiv, ten from Lviv, six from Kharkiv. 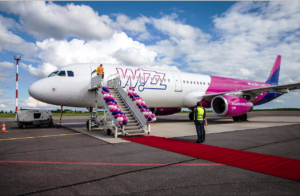 In particular, on March 1-3 Wizz Air began operating flights from Kyiv to Bremen, Billund (Denmark), and Riga, and from Lviv to Copenhagen. According to the company, the deployment of the fourth Airbus A320 aircraft in Ukraine increases the total investment in the country to more than $400 million, as well as the number of jobs created to 140. Kharkiv International Airport saw passenger traffic grow by 30% in December 2018, year-over-year (y-o-y), to 78,600 people. In December 2017, the airport handled 69,050 passengers. Passenger traffic on international routes in December 2018 totaled 60,300 people, which was 37% up on December 2017, the airport’s press service said. Flights to Sharm el-Sheikh (SkyUp, Windrose, Azur Air Ukraine, UIA, Bravo Airways), Kyiv (UIA), Istanbul (Turkish Airlines, Pegasus), Warsaw (LOT) and Vienna (Wizz Air) were most popular. As reported, passenger traffic at Kharkiv Airport in November 2018 grew by 19% y-o-y, to 72,700 people. Kharkiv Airport has a runway with a length of 2,500 meters and a width of 50 meters. It has two passenger terminals with a capacity of 100 and 650 people per hour. DCH manages the airport through New Systems AM. 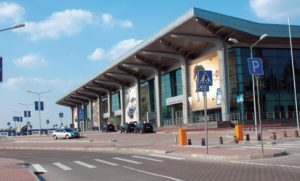 Lviv International Airport in 2018 increased passenger traffic by 48% compared with 2017, to 1.598 million people, according to the airport’s official page on Facebook. The number of serviced flights in 2018 rose by 29%, to 15.429. 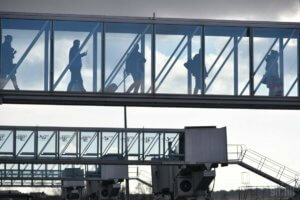 Some 1.39 million passengers were transported on international flights, and 207,300 people on domestic flights. The airport in December 2018 carried 129,600 passengers (113,800 on international flights and 15,800 on domestic flights), which is 58% more than in December 2017. The number of flights made in December reached 1,282 (1,067 international, 215 domestic), which is 34% more than in December last year. As reported, Lviv airport in January-October 2018 increased passenger traffic by 46.3%, to 1.343 million people. 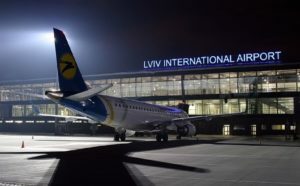 Lviv International Airport is located 6 km south of the city center. JSC Ukrzaliznytsia in 2018 transported 55.9 million passengers in long-haul trains, which is 7.7%, or almost 4 million people, more than in 2017. According to the company’s website, the company managed to increase railroad passenger traffic despite the decrease in the number of cars. “We used many trains after the night trip as day trains. And then again on a night trip. First of all, it concerns the period of peak traffic, long weekends. 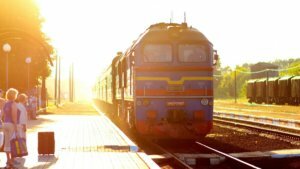 We put on about 40 additional trains for these Christmas and New Year holidays, more than 300 trips,” acting head of Ukrzaliznytsia Yevhen Kravtsov said. At the same time, he stressed that to preserve the traffic volume, the company must annually update the passenger car fleet with at least 200 cars. “Unfortunately, due to low tariffs and unprofitability of this transportation, in this matter we need support from the state, namely, the allocation of funds from the budget of Ukraine for the purchase of passenger wagons as provided for by the law on railway transport,” he stressed.